"So where do you want to go for lunch?" I ask my dad. "Why do we always have to go to pho hong?" 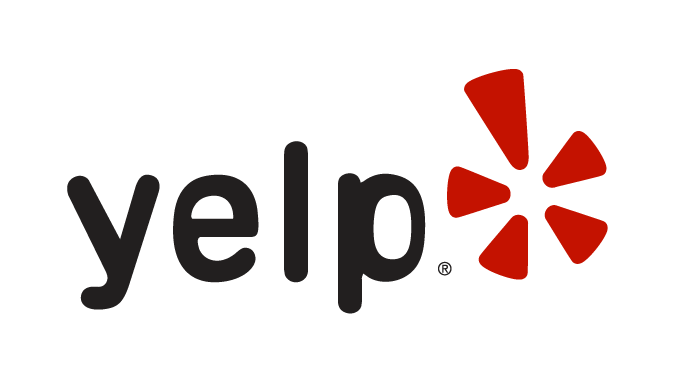 "There aren't any other good pho places nearby." "How about Pho Tam and Pho Century?" "We ate there a few months back, I didn't like it." "But Pho Hong's closed for renovations." He draws a blank and purses his lips. From inside the car I spot Green Basil's signage advertising their $7.95 lunch special. "Stop the car!! 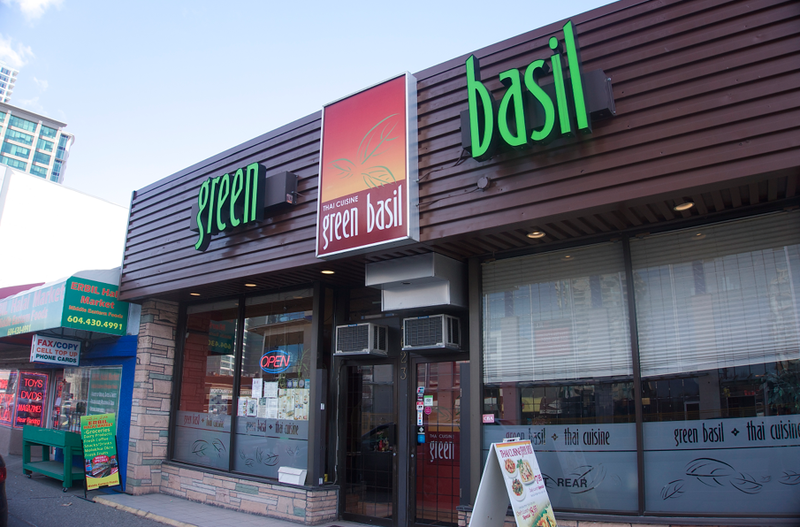 Green Basil's lunch specials are $8!! I repeat: $8!! " After being seated, we're handed three menus. 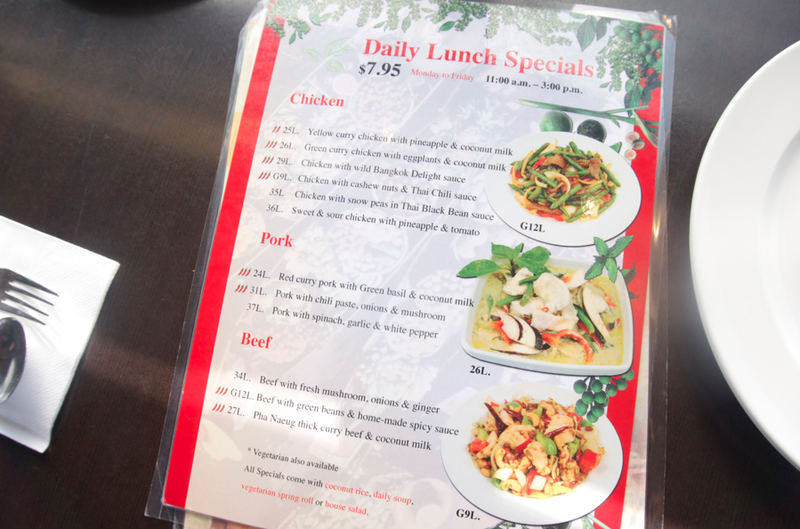 Two laminated ones: their lunch specials, chef specials, and a la carte menu. Being the cheapo that I am, I skip the regular menu completely and zone in on the daily lunch specials LOL. "Don't order any noodles or fried rice." my dad warns. "We're not going to get our money's worth. Order a meat dish!" Thanks for crushing my pad thai dreams dad. I order for the both of us, and the food arrives quickly. 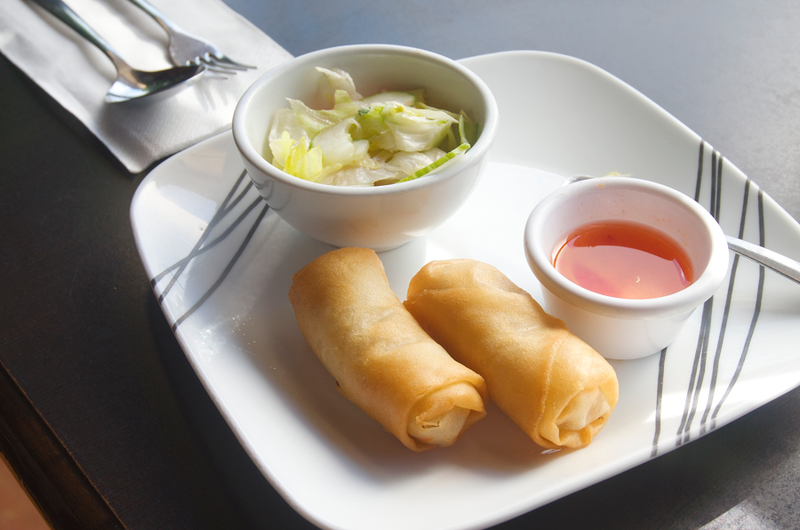 The spring rolls come first, followed by my dad's curry, and my stir fried chicken. "The lighting's really bad in here, I'm going to go near the windows!" I shamelessly take my plate of food over to the windows and snap a picture. "Nobody's looking anyways, it's for my blog dad!!" The lunch specials are a really good deal!! $10 can barely get you full these days!! My dad really enjoyed his pha neung beef curry!! The curry itself was quite thick, as promised, and wasn't watered down at all! There was an ample amount of crisp veggies which may have been to hide the fact that there wasn't alot of beef haha. The beef pieces were chewy and moist, we only wished there was more! 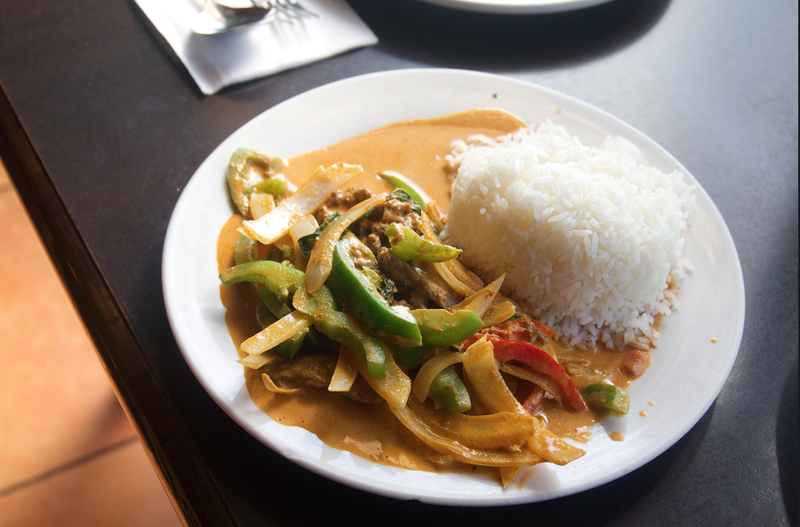 The curry itself was well balanced, sweet, coconuty, with a creamy mouth feel. Green Basil uses wheat wrappers for their spring rolls, but I generally prefer spings rolls wrapped with rice wrappers because I like how they're "bubblier' haha. These ones were pretty standard. Crunchy on the outside, with a mushroom/cabbage filling on the inside. Bonus points for not being oily! 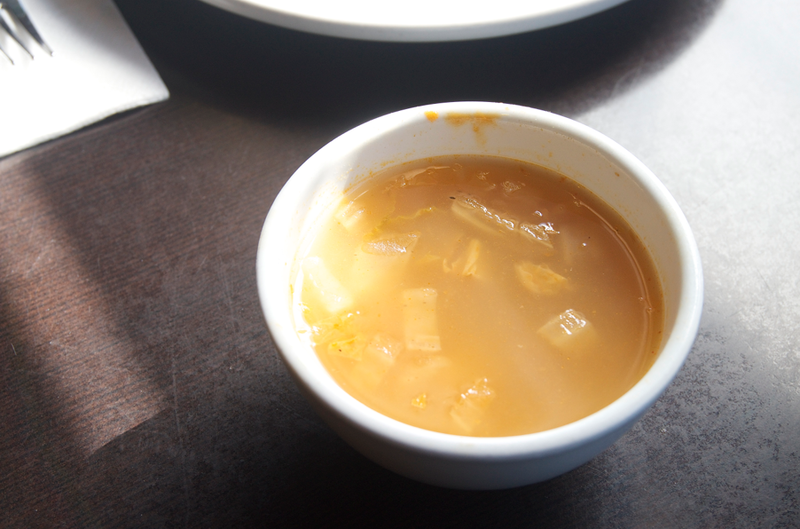 Both of our lunch specials came with a side of soup! I didn't get to try it because my dad gulped down both bowls when I went to the washroom LOL. 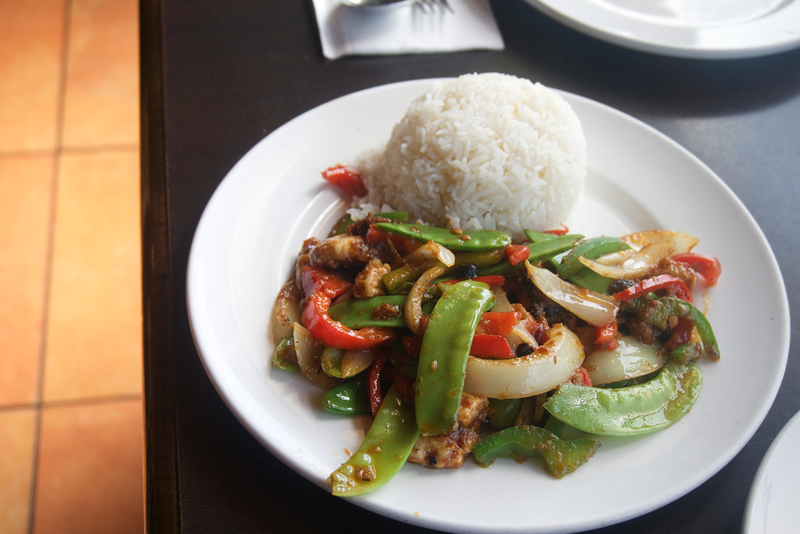 GB isn't bad amongst the more "Westernized" Thai restos in the GVRD. 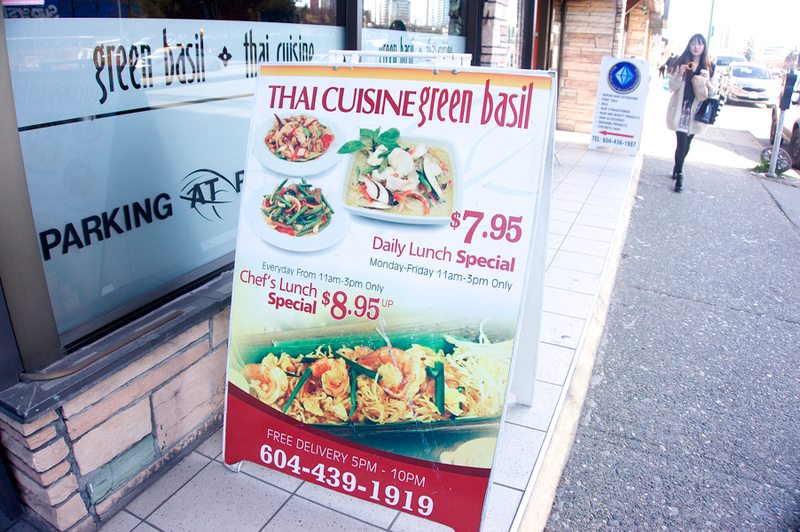 And amongst that list, my fave is Thai Basil on Thurlow. 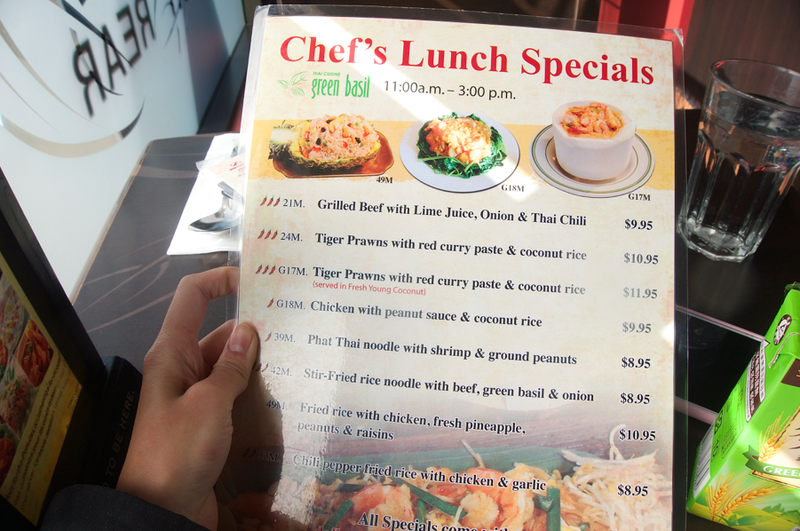 I just looked at some reviews of Thai Basil, I can't believe their lunch specials start at $5.95...that's so cheap!! Especially considering the area they're in! I remember you told me about Beautiful Island a few months back!! Next time I'm in Burnaby, I'll have to check it out! You may be shocked to hear that when Yakko first opened, their lunch special bento boxes were $5.95 ! Ugh, I'm getting hungry looking at them !! Haha wow thats insane! $5.95?